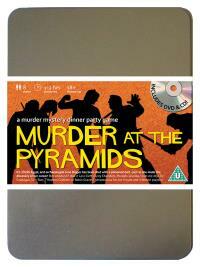 You've been invited to play the role of SIR COPHAGUS in Murder at the Pyramids. Egypt, 1924, and archaeologist June Digger has made the most incredible discovery of the century. Friends and luminaries have gathered to witness her findings but before anyone can say “Tutankhamun”, June is found dead, killed with a poison dart shot from a blowpipe. This was no curse, this was murder! Host your own party to find out who snuffed June’s candle! English Lord (he’s got one foot in the grave already!) Costume Suggestions : Tweed suit, pocket watch and monacle make you the picture of British aristocracy. Every now and then you set your cane down so you can cough into the handkerchief kept in your breast pocket. A large bulge in your trousers conceals your much-abused cheque book, kept close for any investment emergencies. I’m an English aristocrat with a passion for Ancient Egypt. I financed the entire dig and without my immense wealth, the excavation would not have taken place. I have also made it my business to liaise with the newspapers and museums around the world to promote the treasures that have been discovered here.